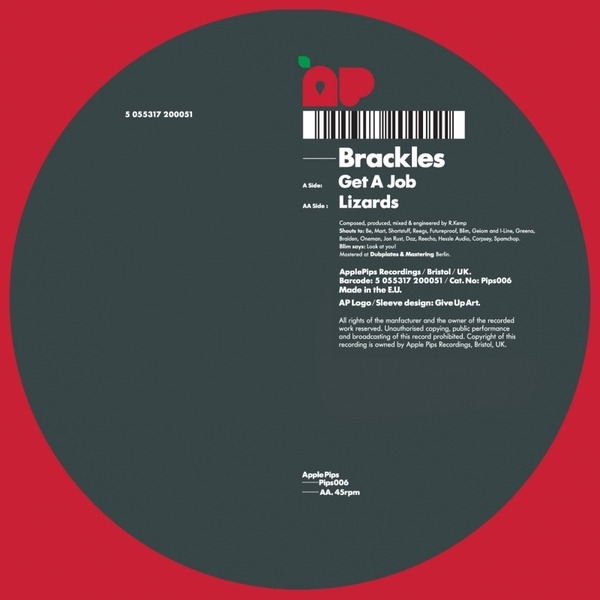 Brackles' second release this week hits the ground running on Apple Pips with two future augmented swingers. Both tracks are informed by a healthy appreciation of 2-Step and Garage functions, with the skipping flex of Zed Bias, El-B or Steve Gurley encoded into its rhythmic DNA. 'Get A Job' on the A-side winds a double helix of influences styles with Zed Bias' tuff swing style offset by Zomby alike synth bursts at 138bpm. 'Lizards' on the flip makes a knowing nod to the UKF scene with a rhythm sounding like a pitched up version of Roska and Lil' Silva making a retro garage track with added noughties edits. Smart tracks for followers of Ramadanman, TRG or Synkro - Big twelve!! !